'Ranger' my 9 yr old, un-neutered, Australian Shep. X has some kind of problem with his skin that has gotten worst over several months now. He gets topical flea treatments monthly. I thoroughly brush him 2 or more times weekly. He eats a quality dry dog food. He's overweight. He itchy all the time. His hair-loss when I brush him is extreme in his crusty, flaking areas. His coat looks greasy, skin has flaking/crusty patches on different parts/areas of his body. I will attach a few photos for you to see. Please, any advice, help is appreciated. 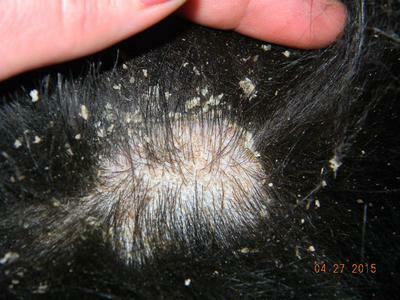 A number of different problems could be to blame for Ranger’s hair loss, itchiness, and skin lesions. If he were my patient, this is how I would go about figuring out what was wrong. First I’d perform a physical exam and take a thorough history. Based on your description of his symptoms, I’m a little concerned that a systemic condition like hypothyroidism or Cushing’s disease might be playing a role. If that were the case, we’d need some blood work and other diagnostic tests to reach a diagnosis. I would also look specifically at his skin using tests such as cytology to rule out yeast or bacterial infections, a fungal culture for ringworm, and skin scrapings to look for microscopic parasites. If none of this led to a diagnosis, skin biopsies or allergy testing might be necessary. 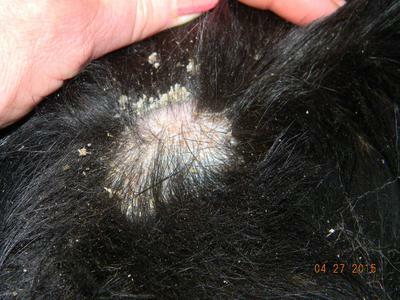 As you can see, the work-up for skin problems in dogs is often quite involved. If your veterinarian can’t help you, consider making an appointment with a veterinary dermatologist. 12 Yr old kirby a 47lb Wheaten Terrier going thru itching dry skin. Dry Salmon & Potato kibble mixed with 1/2 can wet beef or chicken cuts for moisture twice daily. I've fasted him for 24 hrs to help slow down the itching, then just dry by itself to eliminate possible suspects. I don't like using the immunosuppresive Apoquel, but I do have some. I've done medicated shampoo, added to that a few drops of tea tree oil, sulfur & lime dips 3 times. Bannixx for itching, Witch Hazel to clean skin, Chlorphenorlramine for allergy 3 times daily, & Chlorhexadine 2% solution for skin cleansing (only tried this once & his skin reacted so I quit) It's frustrating, but comforting that others have similar issues that vets can't figure out. I've considered that with so many common itchers if it could be the water they drink? Just thinking of common threads. Mine is the same, took her to the dermatologist and they believe it's the mange. Skin scrapings are not full proof. We have her on an oral flea and tick now and a shampoo, which should kill any type of mite she has. Dermatitis. 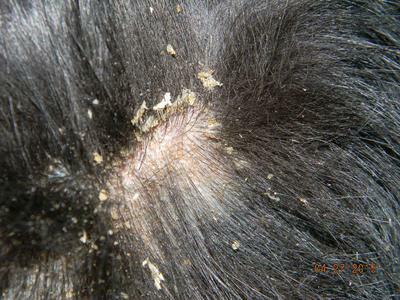 Clean affected area remove all crust hair will fall out also . Skin will probably be red . Apply ZYMOX Topical Cream with 5% Hydro-cortisone to affected area.This usually clears it up within 2 weeks. Don't continue going to a vet, take your dog to a dermatologist. I had an appointment with my Sasha after 4 years of taking her to a vet, but sadly had to put her down (cancer formed on her neck) 3 days before the appointment. The last year and 1/2 was the worst. I had so many tests done on her, doing the same thing day in and day out ruling out what it was. The tests all three vets I took her to couldn't figure it out. Its honestly better to take her to the vet once have them do the tests then call and go to a dermatologist. Doing the small tests at the vet will make it to where you go in the dermatologist they can start with the things the vet couldn't test for. Please contact me if y'all ever find out the result of what your dog has, I just want some peace of mind knowing what she really had. My email is alyssahalla@gmail.com My email is open if you have any questions or results. Same dog, same result. My aussie-mix is black, his red/white brother doesn't have this issue. Poor lil guy has been battling this for years. It gets worse with age. He's 16 now. Apoquel worked for a bit. A steroid used to knock it out years ago when we had no other choice. Not much helps now. Did you ever figure out what's wrong? I have a collie/aussie mix and this describes her to a T. Her coat looks flaky like that, is greasy and starts to stink very quickly. She itches ALL THE TIME. My vet and I have tried everything under the sun. Tick/flea treatment, medicated shampoos, elimination diet, you name it. There is a drug called Apoquel that really seems to stop the immune response, so she can get some relief.